Gingerbread houses, not just for Christmas anymore. When my sister told me she found a great bargain on a travel camper I couldn’t believe what I was hearing "and it’s pink"! She’s a lot like me, the only camping we would want to do is to camp out in a hotel! 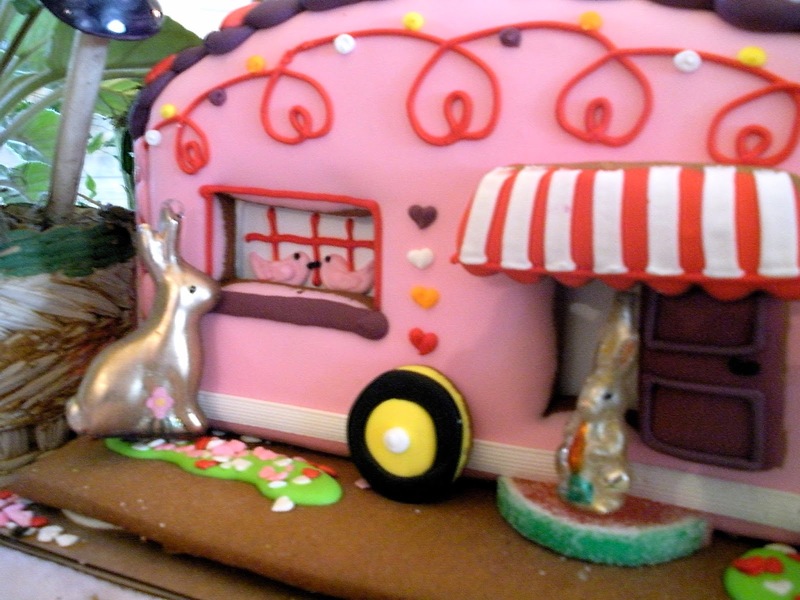 After a few giggles, she explained it was the cutest little pink gingerbread house-trailer, marked down after Valentine’s Day from Harry and Davids. She couldn’t wait to have a few friends over and start nibbling away. She sent a pic from her phone and when I saw it I almost fainted, "you can’t eat that”, I said! I have to make photos to post! After a hundred phone calls she promised she wouldn’t eat the trailer. True to her word she drove all the way from Atlanta and brought the darling little trailer to me, mainly so I would quit calling! I will send her a chocolate Easter bunny treat for her reward. This little “sugar shack” has so much sugar in and on the frosting, with lots of sprinkles, perfect for a sugar rush! I know a certain little boy who wouldn’t have waited to eat this yummy treat! Now it’s all packed away, waiting for a pink and white valentine tablescape next year. 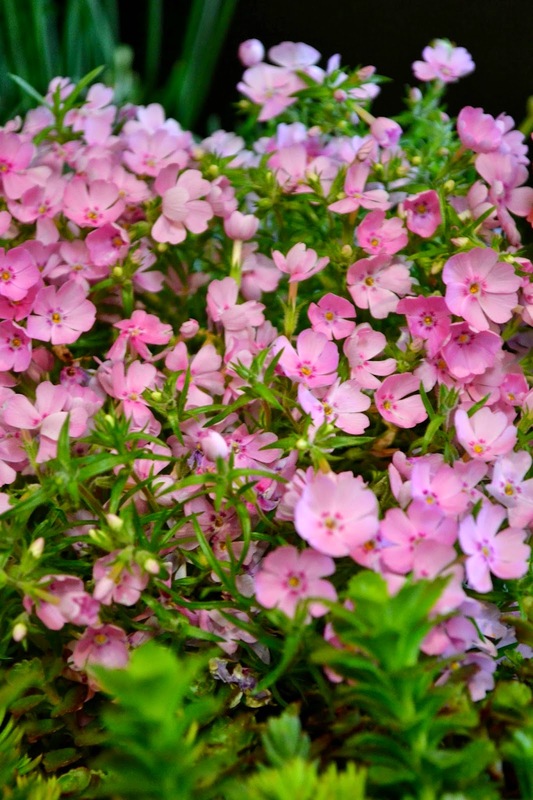 Hopefully the sun will come out soon and I can get my sweet flowers planted. Remember, April showers bring May flowers.......can’t complain. So tell me please, do you like the “Sugar Shack”? Emily, it is adorable! It's obvious that you had a terrific time staging this darling vignette. I can just imagine the giggles that went into to this process. Fun time! 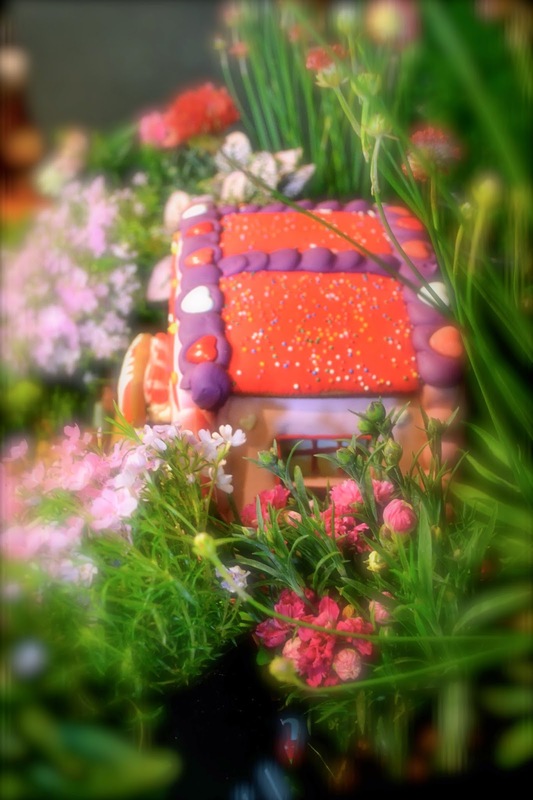 The gingerbread trailer is so cute in the middle of all the flowers! omg Emily, this is THE cutest thing I've ever seen! I can't believe your sister was actually going to eat this!! Way too fabulous for that! I LOVE the way you staged it with the steps and all the gorgeous plants, not to mention the bunnies! You have made this dreary, rain soaked Monday so bright and happy!! Totally brilliant! This is adorable! Somewhere, I read about a gingerbread trailer park - a redneck sugary treat! This is definitely not for that crowd. Classy camping all the way! 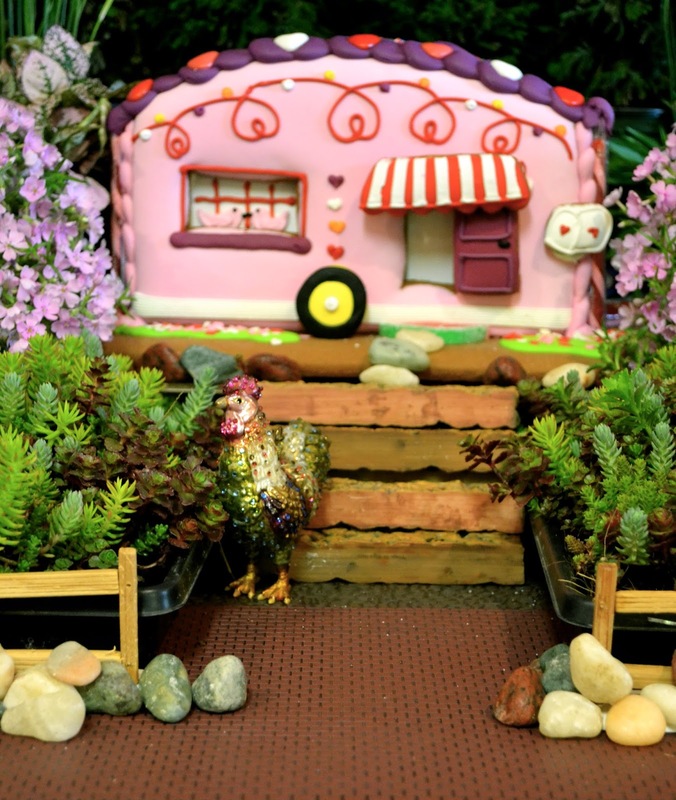 Oh my goodness, that cute little sugar shack looks right at home nestled in the plants. I love your creativity, Emily! Emily, this is the cutest thing I've ever seen! 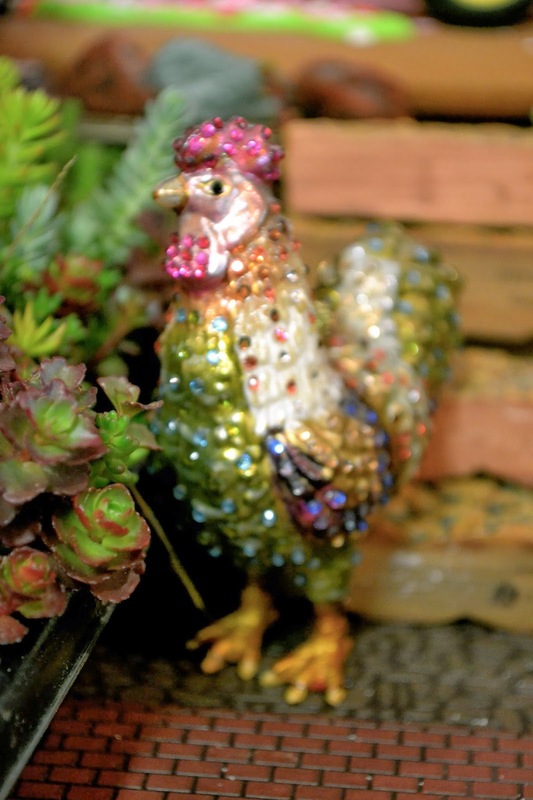 I love the little punk "glamper" and the tablescape, too!!! We were in Tuscaloosa for DZ's parents' weekend, but we helped Shanley Belle move into her new house all weekend long! It is so cute! How can you not like your sugar shack! It was cute enough on its own, but the way you've surrounded it with plant life is just great. This is the second time I've commented on this, because I had to come back and look at it again before I went to bed! I've been thinking about this little camper all day! So unique and precious! If I come back and look at it a third time tomorrow, will I be considered a stalker? Emily -- your next assignment is to take all of these photos and send them off to whomever does the communications/marketing/catalogue for Harry and David. THIS should be the cover of their catalogue next spring. Copyright them and make a sale! The trailer is just adorable -- I read the comments and loved what your sister said about how it smelled, too. But the set-up just makes it quite perfect. This is just about as adorable as it gets. Love it to pieces! What fun you had creating this vignette. I am so pleased you have found my new blog Emily. Welcome back. 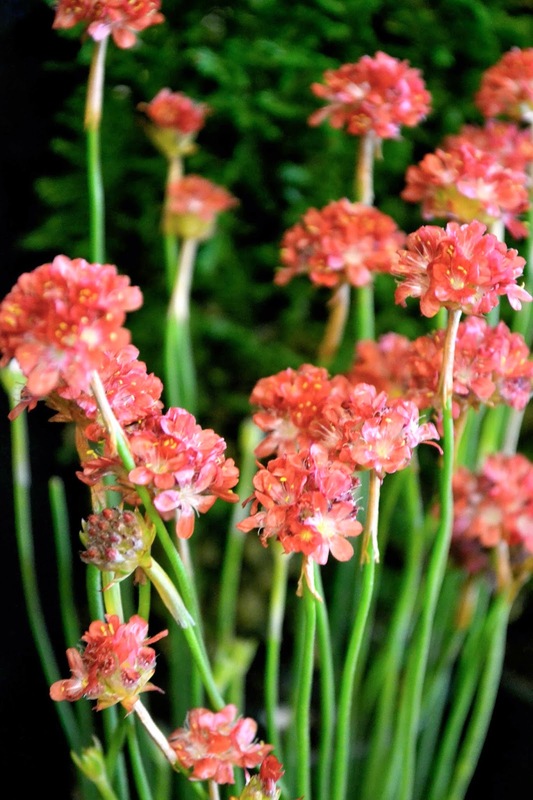 Oh my, what a gorgeous vignette you've created, Emily--I love all the sedum and flowers you used to adorn the pink trailer! Always fun visiting with you, Emily. 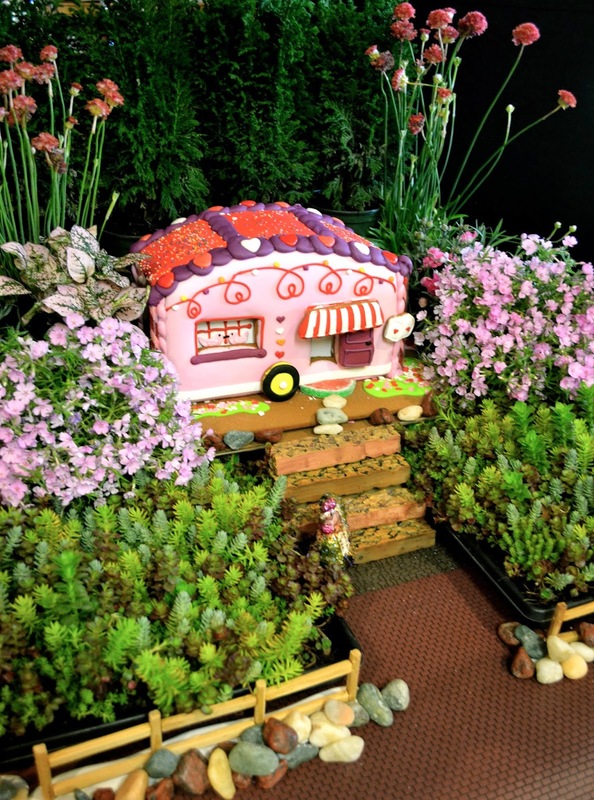 Oh my goodness, Emily, the sugar shack camper and how you've made the cutest vignette with it, is just the most adorable thing ever! What a sweet sister to drive it to you. She certainly does deserve some chocolate!! I do like your camper! It is absolutely adorable. What a great idea to set up a little vignette with your summer plants! It will stop raining soon enough and you will wish for more! 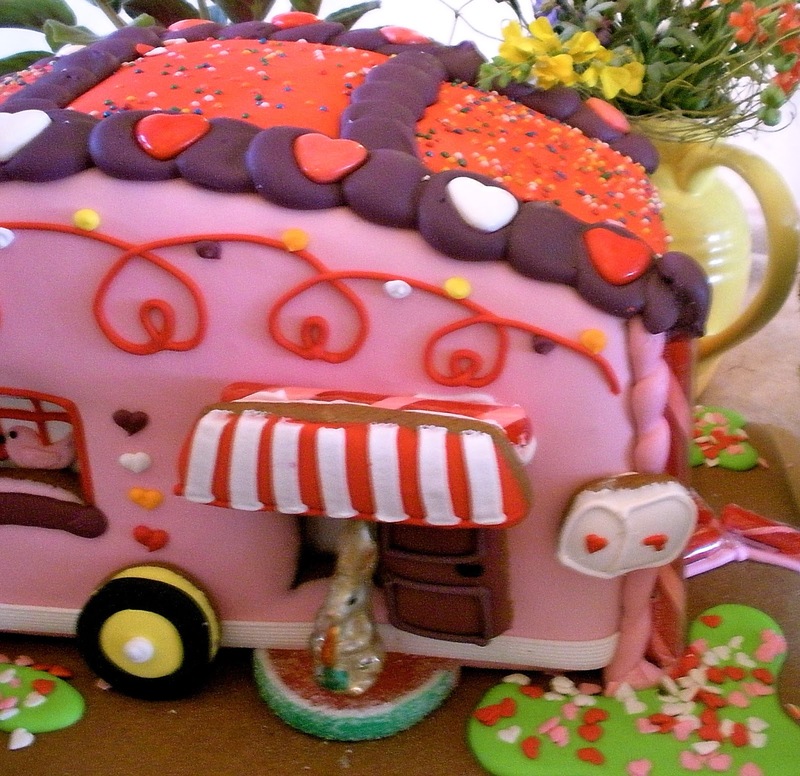 This is the most adorable gingerbread house. I love it. Thanks for sharing with us at Wake Up Wednesday Linky Party. OMGosh! That is the cutest thing ever!! LOVE the little striped awning and watermelon slice door mat. What a fabulous garden you made for it with your bedding plants. Hope you got them planted today. 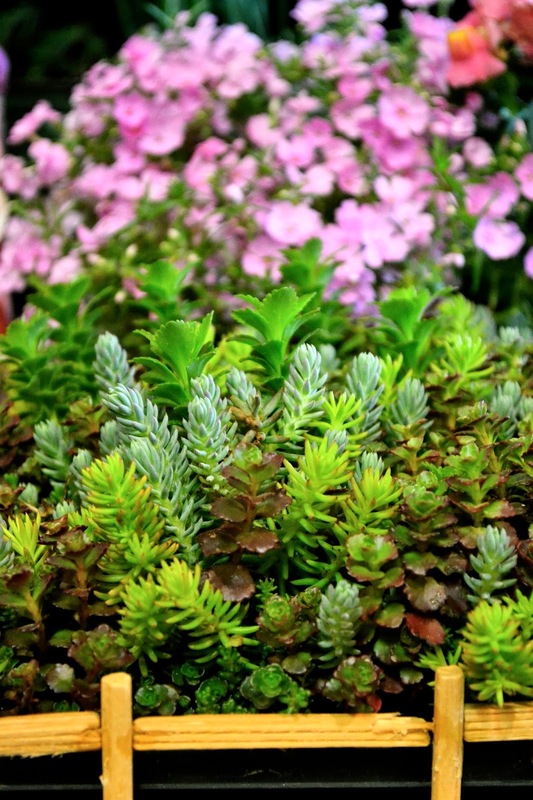 Were are you going to use your sedum? Yours look similar to some I saw at Lowe's. I thought they were so neat. omg. that is so cute! I am so glad you didn't let her eat it! Oh my gosh that is Adorable - way too cute to eat The awning and watermelon slice are awesome too. Love it! Oh Emily, what a DARLING POST! You know I am a music lover for blogs, and your music goes so well with this sweet treat for the eyes! LOVE IT ALL! After such a bad winter, color, bunnies, happiness is all we want! I want to thank you so much for coming to visit my blog; I am very sick at the moment. I did not mention it on my blog because really, the symptoms didn't come until hours later, but I have severe vertigo, and I am extremely dizzy to the point where I can't go into work the rest of the week. I will be only posting once a month or until I can successfully manage what I have going on with work and my writing. I love blogging for so many reasons, but the people whose kindnesses never cease are the reasons I blog. Adorable, Darling, Too cute, FUN! Enjoyed this post so much. Thanks, Emily! Oh my goodness how cute is that! I'm stopping by from the blog hop and I'm a new follower. So cute! And the landscaping is pretty. This is too cute! I love it. Please share your sugar shack at the Bacon Time Anything Goes linky tomorrow. This is so cute! I love the pink, and that rooster is cute too. Visiting from Wake Up Wednesday Linky Party. ADORABLE!! Glad you stopped your sister from eating that cute little camper!! The setting you created for it is perfect. Please thank your sister, because so many have really enjoyed your post!! Absolutely the most charming "gingerbread anything" vignettes I've ever seen. Perhaps my lifelong yearning for a tiny Airstream (pink a bonus) to set in the back yard just because is enhancing the enchantment, but it's simply adorable with all its campground setting and lively inhabitants. And your landscaper is a genius. 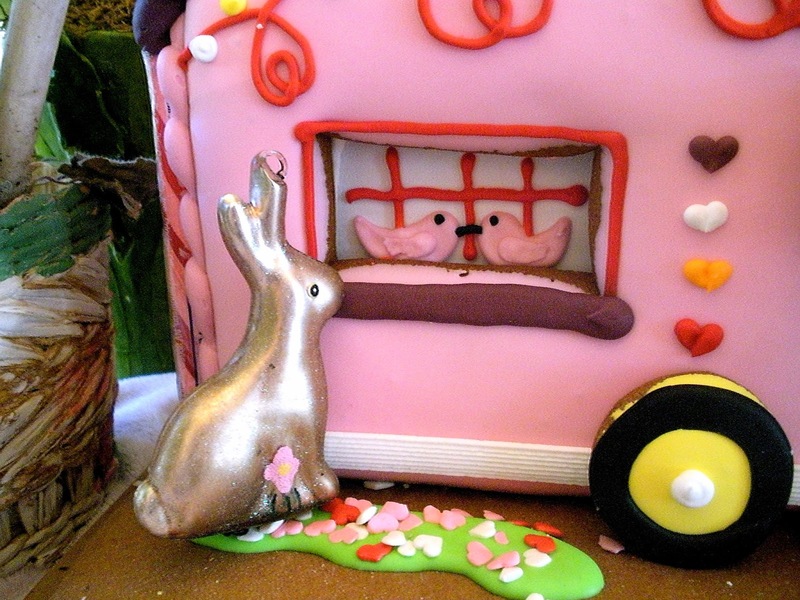 The little gingerbread camper is so sweet love it. I hope you have a wonderful week with your family and YES I LOVE THE SUGAR SHACK. Hi! Well I for one absolutely love that Sugar Shack! So sweet...Cute setting. Have a wonderful Easter. Emily this is so cute. 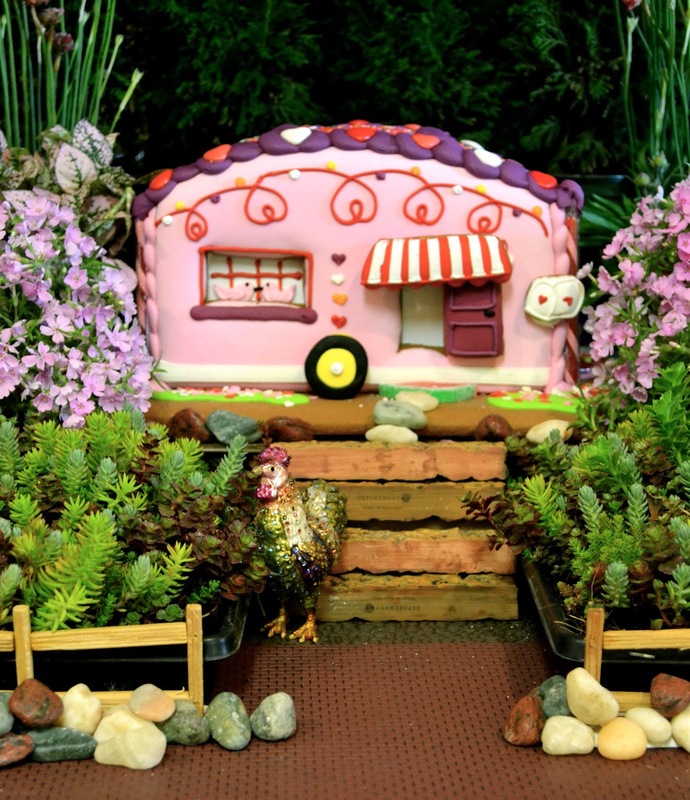 What an adorable tribute to glamping! Thanks for sharing with us - it's just wonderful!